Valentine’s Day is coming! And we basically know what that means! A day of love, flowers, chocolates, gifts and sweet words! Now, I don’t want to be all gooey here. After all, I believe, everyday should be Valentines Day! Whether or not we have that special someone or not, Valentine’s is not just for couples. It’s for everybody! If you are winning over someone, or trying to be romantic this Heart’s Day, or maybe just want to give some love to that special person (it may or may not be your romantic partner – just someone you love), then giving that perfect gift is definitely one great way of showing some of that affection.. I mean, who doesn’t love presents? I’m pretty sure travelers and adventure-lovers certainly do! With the incredible (and cute) items available for smart travelers out there, selecting that perfect gift can be overwhelming.. I should know as I love giving presents if I can! haha. Over the years, I’ve realised that giving something is basically not enough. It should stand out and be something that you’ll be remembered by. So to help you you search for that perfect item, here’s a list of cool and unique gift ideas that you can give for people who (like me) loves to travel! We all want our parents to be comfortable when on a trip. So why not give them this travel pillow from HAOBAIMEI – complete with ear plugs and eye mask! The travel pillow can easily be adjusted around your neck whichever you like for that much needed rest on the plane or on the road. PLUS, the travel pillow is light weight and can be easily carried around. A thoughtful present for parents! Give your parents the gift of memories with this fun and visually creative Instant Fit Camera from Leica! Cellphones, DSLR and digital cameras may be the trend now, but nothing beats a camera that can automatically print your photos in minutes! Great way to collect memories and put in albums, just like the good old days! The camera has a 3-Zone Manual Focus System; 0.37x Optical Viewfinder with Targea and an Automatik-Hektor 60mm f/12.7 Lens. 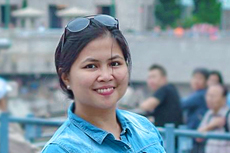 We all know that travelling can easily be a test to how organise you can be in terms of keeping your valuables like documents, credit cards and passports. This DEW Travel Wallet is a cool gift for Mom and Dad to help them stay organised when on the road. Help them be sane by providing them with this practical item. The wallet has an RFID protection (a technology that safeguards your personal information against identity theft), flexible inside organisation, outside storage area for phones and flexible inside organisation made from top material. Get personal and add a cute touch to boring old passport holders! This passport cover will surely be a hit to all travel couples out there who wants a cute (and maybe a little bit cheesy) item with them while they travel. Surprise your special someone with this stylish, scratch resistant and sturdy passport cover. You can also personalise it! If you already have a personalised passport holder (or maybe trying to buy one), then why not pair it with this cute Personalized Laser Engraved Leather Luggage Tags. The luggage tag is laser engraved and comes with a removable contact sheet protected by a plastic film. Toiletries are some of the little things that can often be hard to organise. And organising for the two of you can be a bit hard. This cute toiletry is cool for organising stuff. The bag is big enough to hold items like shampoo, soap, shaving gear, makeup and other necessities AND it goes with a hanging hook so you wouldn’t have to worry if space is limited. Women loves to look good. Like most of the time (I have days when I don’t care how I look, though. Don’t judge me. Haha). But if when we do, flat irons are pretty awesome to have. Especially if you are on the road. This mini flat iron will surely do the trick as it is pretty handy and can easily style the hair any way she wants. It also has a safety lock to keep it safe while she is on the road. Traveling is best enjoyed when you don’t have to worry about your essentials like phones and your wallet. This Travel Money Belt is good for holding cellphones, passport, ID and many more. Very convenient for traveling and you won’t have to worry if you’ll be on the go all day as it’s made up of high quality fabric and can be used for any kind of trips! We ladies love to have our jewellery with us – well most of us. I’m not the type who wears necklace, but I do love my rings and a cute pair of earrings! Despite not owning too many jewellery, I still love having my small items with me when I travel. This Vlando Viaggio Small Jewelry Case offers a practical way of storing our jewellery when we travel. The rollup design is perfect for storing in handbags, backpacks and suitcase. It has 3 compartments of equal size and is made from synthetic leather with velvet lining. When we travel, my husband loves bringing along his gadgets with him. This is good and all except for times when all his gadgets and accessories mix and tangles. Kopack Anti Theft Travel Backpack is an awesome items for men who, like my husband, can’t seem to leave any of his gadgets (and mine too! LOL) at home. The compartments inside are just perfect for organising stuff, it is waterproof with external USB interface with built-in charging cable and it does not hurt that it has Reflective Stripe on the front of the bag to increase safety at night! If he doesn’t like bringing bags, this Men’s Vest is perfect for keeping things while going out and exploring new places! The vest comes with a total of 42 gadget friendly pockets (not to mention water bottles, sunglasses, dog leashes and more! We love watches! Despite having phones (to check the time), we find wristwatches very convenient when traveling. AND it’s such a great accessory too! This Casio G-Shock is pretty cool to own with its shock and water resistant feature. Perfect for outdoor trips! It also has multi-time (for international travels) and full-auto calendar. Make traveling fun and easy not only for you but for the kids! This suitcase has plenty of packing space (with 14.75 gallon capacity) for your kids’ toys and a few clothes. Features include carry handles, horn grips, comfy saddles and more! For children who loves to travel, this Skip Hop Zoo Little Kid Luggage is perfect to teach them independence in terms of packing their own things and being accountable for its safe keeping. The luggage has a retractable 13-inch handle which makes it easier for kids to roll it themselves and has an elastic mesh pocket for bottles. This is one of the things that you can’t really bring on the road, but is definitely a good way to document your travels! Teach your child the value of keeping memories and let their creativity flow! If they are, like me, who wants a more tangible way to store up memories, this Scrap Book Album is perfect! It’s premium quality will ensure that once you start recording, memories will be stored for years! One thing I that I don’t like when I travel, especially on long term, is the amount of laundry that gets piled up. This Portable Laundry System Wash Bag is the perfect present for friends going on holidays, business travels, backpacking trips and camping! It is portable and very convenient to carry around. This laundry system is the modern version of the old fashioned washboard! When we travel, we bring along plenty of our gadgets, flask disk, cables and what-not. Often, we tend to look for bags to fit it all in and make it easier to access when we need it. This BUBM Double Layer Electronic Accessories Organizer is perfect for your techie friend who can’t seem to leave any of his/ her gadgets and any of its accessories behind when going on a trip. It can easily keep all their items and easy to carry. Put everything in one place with this Passport Holder that can accommodate your travel documents, cards, money and cellphone. It also includes a power bank that can charge your phone as you go. It has several designs to choose from which will surely be a hit to your friends! A present is something given to someone you care about. There’s no need to wait for an occasion to give something. What are you waiting for? That phone charging passport holder and the Leica camera would definitely be on my list! What a great, comprehensive list with gifts for everyone! Great products! Would really need the organizer for my electronic accessories!! Great and very very useful ideas! And the ones for the kids are soooo cute!!! The personalised Passport holder is a nice idea. That cutie little stroller bag. My Daughter will love it! Will get one before our upcoming Maldives Vacation. What a great list of gift ideas. I think Darcee would love the jewelry case and I would LOVE the Leica camera. Reminds me of the old polaroid cameras we used to have as kids. 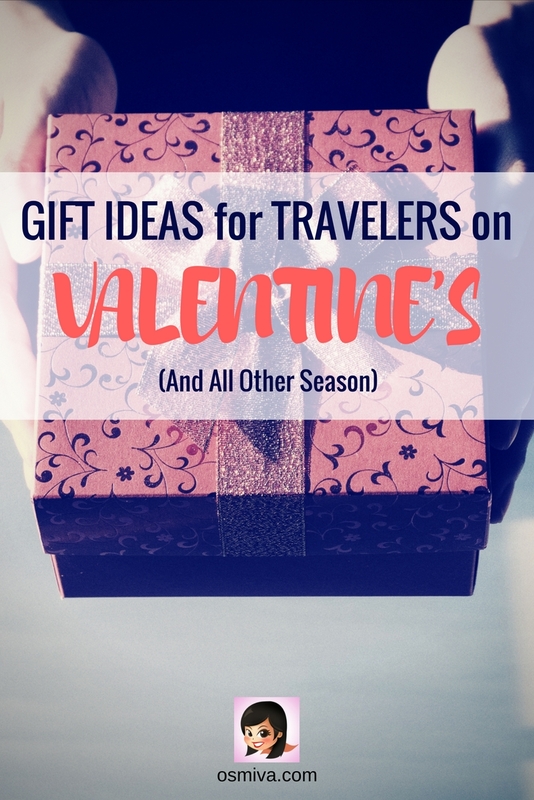 This is a great list of gift ideas for travelers! I love the cute passport holders! Especially if they can be customized, what a nice, thoughtful present! Great post. I especially liked the travel pillow and adventure book. Will keep in mind for future gifts. These are some exceptional ideas and I would love to have all of them, Marvi. I fell in love with that adventure book! Nice set of gifts for travelers. I like the idea of the instant camera. That is something unique and novel and I bet a lot of people would love it. The his and hers is also, a nice idea for a couple. For a guy, he definitely would like the electronics organizer. Glad you shared this. That is a cool list and I liked the way you have organized it. Personalised passport holders and luggage tags are what I was looking for ourselves. This Portable Laundry System Wash Bag is another interesting thing, I really need to check this out. Nice Collection. I liked the idea of couple passport holder. BUBM Double Layer Electronic Accessories Organizer is indeed a good idea. I normally stuff all my accessories in a small ‘cube’. The anti-theft backpack is a cool idea though. Not sure its available in my place but will get it someday. Love the products, specially the passport holder + charger. It will definitely turn out to be a saviour for me. Love the idea of the travel pillow as well, apart from the men’s travel vest and stash band unisex money belt. Love the idea of the instant film camera idea! That would be perfect for making a quick postcard out of! Never heard of the portable laundry before, interesting! I know my mom would love one of those travel pillows you’re talking about. she’s got one, but it’s the common one and she doesn’t really find it too comfortable so I’ve been looking for something better. I also love the idea of the couples’ passport covers with their names on it! How cool. Instant camera and backpack would be such an amazing present! And the comfy pillow of course. These are so good! I especially love the customized luggage tag! I need them all! There are some super cute gift ideas here. I really like the look of the instant film camera. My husband doesn’t like the look of the instax models but I think he would love this!! Plus it’s Leica so the photos should be good! 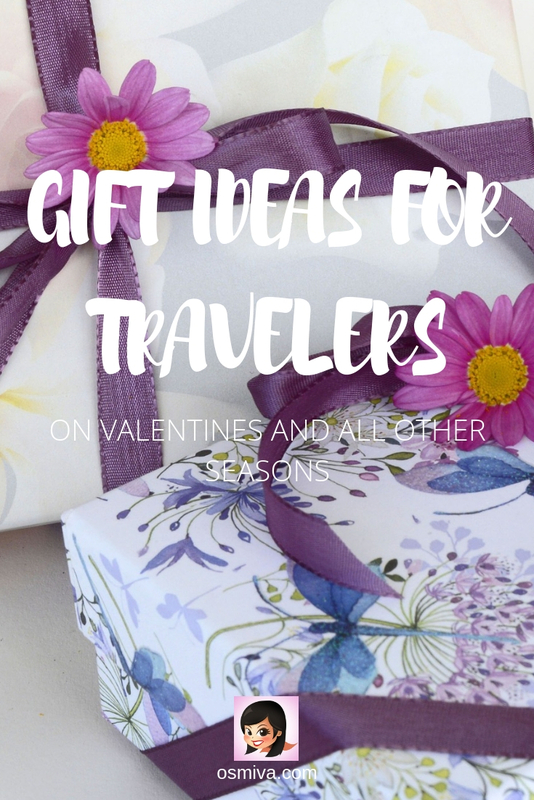 I am always looking for ideas for gifts for travel lovers, mostly because my family ask for ideas on what to get ME and I need some new suggestions! I’m liking the Haobaimei travel pillow design, and the Bubm accessories organiser! Awesome post! I was just browsing through the internet for what i can give to my boyfriend who is also a photographer, for valentine’s day. Now i have something to consider. We love the trunki in our house. I’m intrigued by the phone-charging passport cover. Sometimes I’d rather just have travel as a gift!